It was a wet weekend in Pangalengan, a sub-district located in the south of Bandung City, which is famous for several tourist attractions. Although it was already in the rainy season, we still insisted on going out. We drove all the way here to have some vacation because every weekend, my family and I always go out to have some family time. I told my dad about this place we haven’t visited in Pangalengan after my friends told me. It is located near the plantation area which the government own. Along the way there, we were treated by a green expanse of tea plantation resembled a huge wavy tapestry that adhered to the mountainous land. I wiped away the dew on my windshield to see the clearer view but the raindrops outside the windshield forbade me. I always love the view here where the viewpoint is wide and far. The rain was almost stopped, but it was still drizzling. Leaving little drops for the wiper to work. I told my dad to turn off the air conditioner because it was really cold and opened up the windshield a little bit for air. But the air coming inside was not any kinder. GPS failed to bring us to the place. We had to make U-turn a dozen times in the middle of foggy tea plantation and came to the same T-junction for three times. But after we asked a local about the place, we made it there. 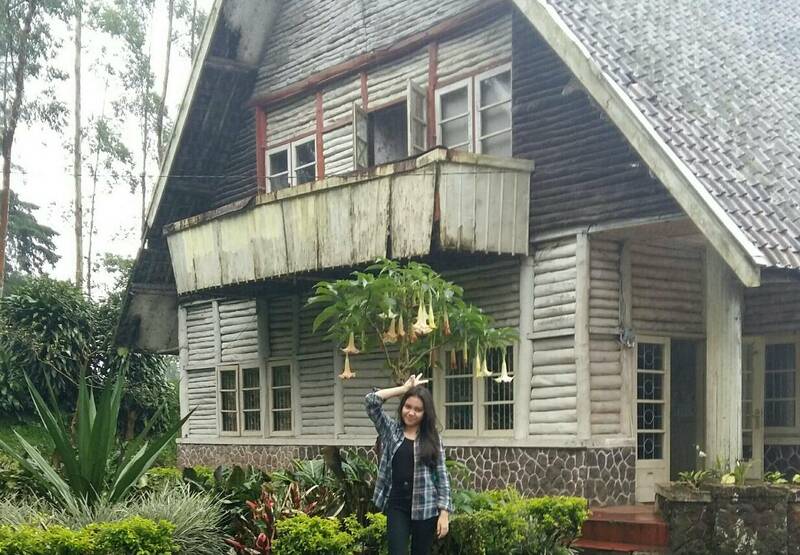 It was an old colonial house near a tea plantation. In fact, this two-storey house became famous after the latest horror movie filmed here. So, it was basically a haunted old house that everyone was curious about. The rain was pouring hard the time we arrived. The sky got darker as to define the spooky aura of the house. Wrinkles and dullness of age was shown on its face. The house had the triangle-European kind of roof with shabby tiles and some of it was in disarray. The wooden wall was the kind of small logs that compiled together on all sides. All in dull white and some were black. It had a front yard that was well maintained. A plant with yellow trumpet-like flowers was the only thing alive from the house. I got out of my car and the cold splash of rain touched my uncovered skin as a run out to the house. I got to the red brick stoned steps at the left side of the house where the entrance was. There were people at the door who asked for the entrance ticket. I looked at them to make sure that they were people. No pale faces, no hollow eyes. They wore green uniform and boots which covered their feet—thanks God they were touched the ground truly. I would worry if the gravity didn’t get them. So, my father gave them the fee and we went in, craved for the warmth. The creaky sound of the wooden floor welcomed us as well as the rancidity and coldness. No warmth, I sighed. My little hair on my skin was all standing up to protest. It was dimly lit inside but enough to show me the beautiful vintage wallpaper. The owner must love the lovely pattern of the wallpaper on a color. I was not sure about what color it was because it has turned to be pale beige. There was a big photograph hanging above the fireplace. It was the character Ibu from the horror movie. She looked creepy. She looked as she was watching the visitors that dare to come to her place with the how-dare-you-come-and-disturb-me,- darling expression. I didn’t watch the movie—I won’t. But I knew from my friends that she was the ghost of the movie. She was quite famous I think. I hate horror movies. I stopped watching horror when I in junior high school after I watched the scariest movie I’ve watched. I came home and couldn’t sleep at the night. Once I managed to sleep, I was awoken by a nightmare. I was gasping and sweating dramatically in bed. That time I knew that that typical scene was true. Although actually I kind of “blind” to this kind of thing. I haven’t—I am not going to—experienced any kind of mystical things in real life. All I experienced was that I felt it or I think I felt it. I don’t even know what it is like. Sometimes I wanted to know how it is like. But, the only thing in my head was how to turn on the fireplace because I was freezing to death and ignored the stare of Ibu. I moved to other rooms. There was this dark narrow hall if I went to the left and there was this little kitchen with a window as the partition on the right. I went to the left first. It was really dark as if there was nothing at the end of the hall and my breath started to be puffed. I thought about what things would have come from that nothingness. The room was at the end of the hall. My father stuck out his head to see what was inside. I prepared myself for a scream from him but he went in without hesitating. It was bigger than the room before and brighter because someone opened up the window. The room was pretty empty. Where were other visitors? A loud thump suddenly heard from the ceiling. We didn’t know what it was. But I saw nobody except the keeper at the front after we came in. It freaked me out. I moved to the place that seemed to be the bathroom after passing the kitchen. It was really dark and wet. There was a creepy old well with its puller at one side of the room. I started to feel uneasy and started to take a step back when there was someone blocking me. Who stood behind me? My parents were both in front of me. I saw no other people besides the keeper at the front. My heart started to thump and dared myself to turn. It was a man. I gave out a big sigh because his feet touched the ground. He turned out to be another keeper and started to tell us the history about this house. Besides telling us about the house that had been there for two centuries and had been used for the place for the officials of the PTPN lived, he told us that he was seeing many ‘things’ at the time he was speaking to us when I barely felt anything at all. He told us that there was a beautiful naked lady bathing right in front of us. We started to feel uneasy. I observed my father as he put his palms at the back and the way his eyes saw his own feet nervously when the keeper told us about his seeing. My mother’s eyes weren’t stay on one point. They were wondering around the room worriedly. So, I told the keeper to stop and showed us the other rooms instead. We were heading to the stairs that led up to the second floor when that loud thump came to my ears again. My cold palms felt wet and colder. Slowly I made the old stairs creaked one by one. They were full of dust I surprised I didn’t sneeze. Suddenly the thump became louder and repeatedly. I heard voices like a conversation. Were the ‘things’ do chat? I dared myself reached the top. There were the open door to a wide room with the same kind of wallpaper and what looked like a white gown tail. Not the dusty kind of gown or the bloody kind. It wasn’t creepy at all. I thought about the possibility the ‘things’ fooled me by showing the good view at first then attacked me afterward. Confused, I stepped in and found a beautiful woman wore a wedding dress with a man. In front of them, people went here and there while bringing photography stuffs. All their feet were reaching the ground. In the haunted house the keeper told us, these people were doing pre-wedding shots. We came back to the front after finished with our ‘vacation’. All my tiny hair didn’t stand up anymore and the air got a little warmer. My father took out his phone and started to take photos. I was terrified and worried that I would wake up the tiny hair on my body. What if the camera captured something?—particular something? But nothing happened. That’s what people with mystical experiences are talking about. Not me. So when my father acted as a photographer by telling me and my mother to pose, we did.